Taxis are a funny thing. I’ve never really thought about them in much detail until this last weekend. Getting a taxi in Lusaka is very different from getting a taxi in Dublin. In Lusaka, you first tell the driver where you’re going, and based on that, you negotiate the price, working your way down of course. This is always fun when at a taxi rank and the other drivers can overhear you because you can get a more realistic price for wherever you need to go as most of the other drivers will try to out bid the first driver you approached. 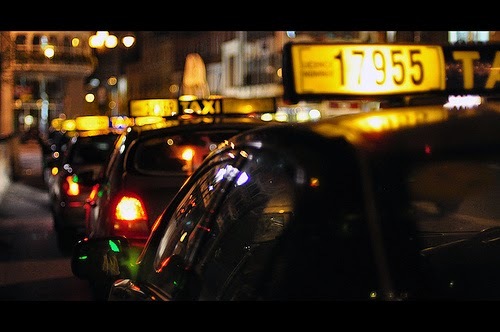 I rarely travelled around at night in taxis, but the little I remember – and bear in mind this was over ten years ago! – The taxi drivers always travelled with a sidekick in the back seat to..ensure their safety I suppose? Or to make sure no one runs out on a fare? I don’t know. They always travelled in pairs anyway. The last time I was in Lusaka, there was an attempt at regulating the industry. Official taxis now have to be painted a beautiful sky blue, but you still get the pirate ones quite often. Dublin is very different. Everything tightly regulated, everything very un-negotiable. But of course both systems have their advantages….and their disadvantages of course. But back to my actual story…. So Saturday night I had my first night out in a long time. Honestly, between college, work and my stupid teeth, I have not been out at night on my own, as the French would say, sans bébé, for a very, very long time. There was dinner and drinks and lots of talking and I left the pub in very high spirits at 11:10 and hey presto! there was a bus that would take me to my next stop, due in one minute. So I got that bus, and oh the traffic was manic! My bus home was at 11:30 and I could see the hands on my watch slowly slowly crawl to 11:31 as the bus came to a stop at the traffic lights and my bus whizzed past across the street in front of me. And it was the last bus of the night. Darnit all I’ll just stick my hand out regardless of whether the taxi light is on or not and someone will stop eventually. So I did. And more taxis whizzed past. And then one didn’t. He kind of slowed down and then whizzed past. And I was turning around to give a silent curse when I saw that oh, he actually stopped a little way behind me. Happy days. And I ran over and when I was level with the taxi I noticed that the back windows were all blacked out. At this stage I had my hand on the door handle and, my body moving on auto-pilot, the door was already opening. I bent down and forced a smile and asked if he was available to go and he said he was. So I kind of pretended to take my bag off my shoulder while looking closely into the back seat to make sure there wasn’t someone hiding in there waiting to chloroform me the second I was inside. So, feeling I had already committed myself to getting in and it’d just be plain ol’ rude not to at this stage. after all I’d stopped him and all, I got in. I should probably add what the driver looked like because it matters. He was an older gentleman, I’d say in his sixties maybe? Big salt and pepper beard, cap on his head and when I got inside, I saw that the driver’s seat was pushed back to compensate for a big belly that was pressed against the wheel. He actually looked like someone’s mean, hairy grandad. “I’m going to xxxx” I said, “near xxxxx? do you know where that is?” I always ask that anyway as it’s a bit hard to find, and put my bag on my knee. He didn’t answer, just nodded, checked his mirrors, pulled back into the traffic and … locked all the car doors. I heard the central locking system and my heart. Oh my heart! I said to myself, will you calm the eff down. You always lock all the car doors when you get in a car as the driver (force of habit), just don’t panic. keep calm. And I did. But I told myself not to be stupid, keep on my toes, thank goodness I don’t drink, now put that sobriety to some use. I took a good look at him while saying casually that we could use route A instead of route B to avoid the traffic and it made sense as it was quicker. He said “yes” and nothing else. But I fished for more details like, he wore a very distinctive cap and yeah, there was no mistaking the beard, or the belly. In the dark interior, he looked foreign. The cap had a Cuban flag on the side, maybe not Arabian or Persian but cuban maybe? . Probably Cuban as he had a Fidel Castro vibe going. See, in most Dublin taxis, there’s a panel on the glove compartment with a mug shot of the driver, his details, registration number of the car and with the regulation authority, stuff that, if you were unhappy with your trip, you could easily report to the regulator. There was nothing in this car, not even a meter for telling how much you owed. My heart started to beat real fast right about then and I thought what am I still doing in this car? I should tell him to stop the car right now. I read a lot of murder novels and stuff about serial killers and the one thing they always say is, never let someone drive you somewhere if you are feeling threatened because nothing good will happen when you’re isolated. Yeah, my thoughts always go to being found dead. So I looked at my options. He wasn’t driving very fast because of the traffic, so I could probably yank the door open and jump out if he drove a way that was not the way I’d said. And, I could pretend I was checking a text, switch on my “find my friend/phone” app and stuff it into the seat so the police would at least track him down when my cold decomposing corpse showed up. And if I was just going to be molested or something worse, then I had to try and remember every detail. I had to get him talking and I had to look around, colour of clothes, hair, eyes if I could, the car… as much as possible. I said “are you from Dublin?” while glancing up to see if there was anything I could see on the inside of the roof, and ha! There was the taxi meter ticking away. Well, I’ve never been more happy to see one in my life. I relaxed a little but put my hand on the door handle just in case. We stopped for a red light and I looked out to see how squished I’d get if I jumped out and inevitably rolled in front of a car…or under it. Gulp! And he had the most Dublin accent I had ever heard. “Were you out on the town?” he asked. Him talking made me a bit more relaxed but mama may have raised a fool who gets into dodgy cars but she sure as hell didn’t raise no complete fool I can tell you that. Pssht! Even I could pass for a Dubliner if I put on an accent. And if he were a dub, he’d know all the best places to hide my corpse! Yes. I lied through my teeth. It was for safety. You’re allowed to, when you don’t feel safe. He asked me where I was from originally and I told him, then he asked how much a flight cost there and I told him, and he was suitably shocked and said he flew to Cuba, his favourite country, a good bit and flights there were much cheaper. And he told me to check on this website and that website and these agencies would give me a good deal, and well, he was just lovely. And he smiled and he really was like someone’s grandad, only kind and a little bit scary. And I got home and because I was “a young mum, who sounds like she doesn’t get out much” according to him – I should have taped that piece for my sister, you know who you are – he only let me pay a tenner for the trip. And I left the car relieved that I wasn’t dead but also touched by what a wonderful person he turned out to be. There’s something about accepting the primate side of me that warns me of danger and trusting it to a certain extent to let me know that when I feel threatened or uneasy, it’s trying to tell me something. And even if it turns out to be wrong, as it did in this instant, I have to honour that at some stage, thousands of years ago, that’s what kept humanity alive. I may not have grown up feeling I could trust those instincts, but I hope I can help Roz nurture hers. That part that tells her no, she doesn’t want a hug from that person, or that person is scary, or that person seems nice. Regardless of whether she will be right in her assessment or not, I have to give her the space to explore what this means for her, and where her inner strenghts lie. We all have them, and so many of us are told we cannot be trusted as children, that we grow up believeing that we really can’t. I have to go, but I will write more on this, because I love this part of evolutionary psychology and parenting. Stay safe and yes, trust your gut and be wary of getting into cars with strangers. Interesting! I had a feeling it had a happy ending but I wasn’t sure which way it was going to go. I often worry about taxis though I always take one when I’m out. It’s the only circumstance under which we get into cars with strangers – in no other case would we do it. And yet, we have to or the whole systems falls apart. Interesting! Isn’t it just crazy? as long as there is a taxi sign, we automatically lower our guards. And before Saturday, I would never have thought twice about it. Great post, I was worried there for a while but so glad it ended well. I am just like you, despite what my instincts tell me I will often go along with things in a silent panic, but afraid to offend! Oh, I could write a book on not wanting to offend people 😀 I’m glad someone out there has the same thoughts. Previous story What are we reading today?